When you’re playing a dying VR game, and you fail to log out when its servers all go offline…. While the game was still active, Momonga and his guild comprised the highest-level, most skilled players the game ever had. The mansion their guild inhabited was set up as a dungeon to end all dungeons in the game, with NPC’s (the “Pleiades”) patrolling each level that were usually more powerful than most every other player in existence. Then came the day the VR-supported MMO game was to close its servers for good. After fiddling with Albedo’s programming, Momonga decided to sit about to wait out the shutdown just to see what would happen. Unexpectedly, he became the Overlord of a whole new world within which his mansion was plopped into. NPC’s now had their own will and character, and now Momonga had an Albedo who will forever be madly in love with him (and no way for him to undo it). As the only remaining guild member, Momonga changes his name to “Ains Ooal Gown” — the original name of the staff that embodies his guild. The remainder of Overlord is his adventures in this new world…. Kono Subarashii Sekai ni Syukufuku wo! means “God’s Gift upon this Wonderful World!” — in other words, we’re talking about the Anime show called KonoSuba. KonoSuba is meant as a comedic twist on the plot concepts used in the show Sword Art Online that preceded it. It’s set in an MMO-type world where a number of species and classes of people can interact and complete quests for rewards. 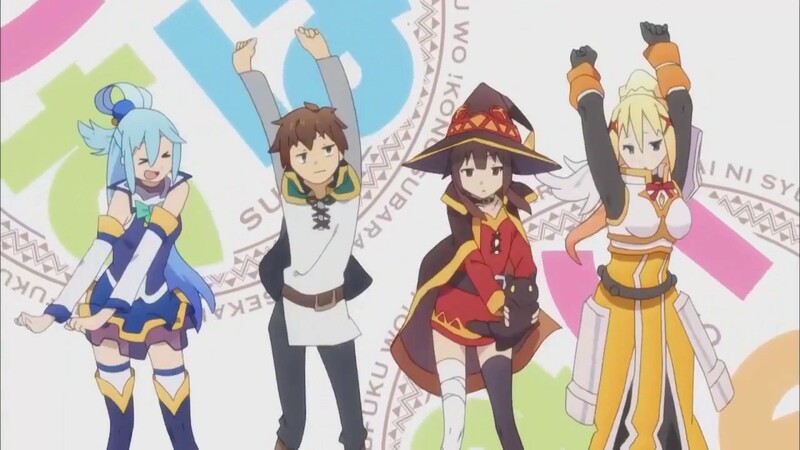 If Kazuma’s brief life on Earth was anything to go by, one would expect him to be the most useless member of his new band of misfits. However, he certainly surprised me by quickly becoming quite a reliable member of his new team once he arrives upon that Wonderful World with Aqua in-tow. Aqua, despite being a goddess, can only really be counted on to provide supporting magic for her crew; that said, the magic she can bring to effect is rather impressive and potent. Megumin is only as reliable as the first explosive spell she can manage to cast, in which case one must hope she hits something with it. Finally, Darkness can’t make her myriad of attacks hit their mark even if her life depended on it; as a result, she channels her inner masochist and becomes a human shield for her team (the only thing she can do effectively). As a result, in order for the team to succeed, Kazuma needs abilities that can pick up the slack; though he fights well and good when he needs to, and is even quite cunning to boot, the abilities he learns often end up being wasted on “parlour tricks” such as relieving cute girls of their undergarments. It’s a wonder those four can ever complete any of the quests they undertake! Though they have their own respective incompetencies, the fact remains that they can still be relied upon to do what needs to be done. There’s two full, entertaining seasons out so far. Let’s see if there’s a season 3!